Jamie McMurray picked up the 3rd last-place finish of his Monster Energy NASCAR Cup Series career in Sunday’s STP 500 at the Martinsville Speedway when his #1 Cessna / Beechcraft Chevrolet was involved in a single-car crash after 105 of 500 laps. 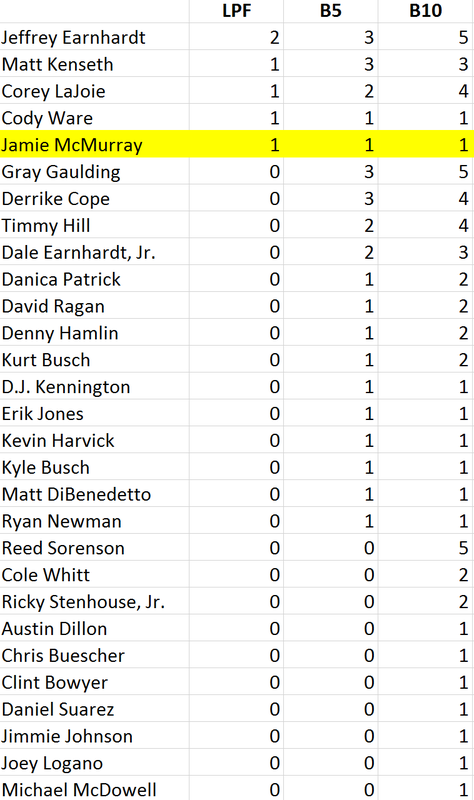 The finish, which came in McMurray’s 516th start, was his first of the season and first in a Cup Series race since last fall at Dover, 13 races ago. The engine failure that left McMurray last at Dover ended McMurray’s Chase in the first round for the second-straight year. It also ended a streak of 312 races without a last-place finish, dating back to the spring Bristol race on March 16, 2008. But the 13th-place showing in points and third-straight season without a win motivated the veteran from Joplin, Missouri, and he and teammate Kyle Larson have performed much better this season. 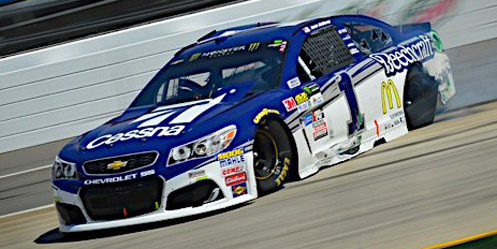 Following a 28th-place finish after a late crash in the Daytona 500, McMurray came into Martinsville having finished no worse than 15th in each of the following races. His best run came last Sunday at Fontana, a 6th. That same day, McMurray’s young teammate Kyle Larson broke through with his second career victory, ending a streak of near-misses and runner-up finishes. With the short track approaching, Larson had the point lead and McMurray sat 6th, 81 points behind. McMurray was one of just 38 drivers to arrive in Martinsville, the shortest field for a Cup Series race since 37 rolled off in the final race at North Wilkesboro Speedway on September 29, 1996. The #1 car again showed speed early, running 5th in opening practice, 15th in Saturday morning’s session, and 3rd in Happy Hour. When rain washed out Friday’s qualifying, McMurray secured the 6th starting spot on points with Larson on pole. For the fourth time in six races this season, Rick Ware Racing’s #51 Chevrolet lined up last, this time with new sponsor Go-Parts.com partnered with driver Timmy Hill. Joining him at the rear was Daniel Suarez, sent to a backup car during Friday’s opening practice when he backed into the outside wall. When the green flag dropped, Suarez held last on the first lap, then passed Gray Gaulding’s #23 SunFrog.com Toyota. Gaulding caught teammate Corey LaJoie, and he passed his #83 RMC Events Toyota on Lap 4. Jeffrey Earnhardt came into Sunday’s race on the heels of back-to-back last-place finishes. His #33 Chevrolet, which by Sunday carried a hood decal for the Honor And Remember Foundation, fell to last the first time on Lap 6, 11.1 seconds behind the leader. By Lap 15, Earnhardt was hugging Timmy Hill’s rear bumper, but both the #33 and #51 had lost touch with the rest of the pack. On Lap 21, Earnhardt was the first to be lapped by race leader Kyle Larson, but three circuits later Earnhardt caught Hill in traffic, dropping the #51 to the rear once more. Hill lost a second lap on Lap 45, a third on Lap 67, and a fourth on Lap 98. McMurray, meanwhile, was again battling hard for position at the front of the pack. By Lap 106, however, his #1 was smoking heavily from the left-rear tire. A few laps earlier, McMurray was on the outside of both Ryan Blaney and Jimmie Johnson, who both made contact and slid into McMurray’s left-rear. In a questionable decision, the crew kept McMurray out on the track for several laps. The gamble didn’t pay off. On the 106th circuit, heading into Turn 3, the left-rear cut down, sending McMurray spinning into the outside wall. The car made hard contact with the driver’s side, in particular the left-front, and had to be towed back to the garage area. Under NASCAR’s new “Crash Clock” rules, this eliminated McMurray from competition. On Lap 110, he took last from Hill. A series of other crashes during the final segment filled the Bottom Five. 37th went to Daytona 500 winner Kurt Busch. Busch’s #41 Monster Energy / Haas Automation Chevrolet was damaged in a multi-car accident on Lap 290, beat the five-minute clock, then on the restart lost a tire and slammed the wall in Turn 3. Jeffrey Earnhardt ended up 36th, having hit the Turn 2 wall on Lap 392. 35th-place Matt DiBenedetto’s Lap 408 wreck appeared even harder than McMurray’s when his damaged #32 KeenParts.com / CorvetteParts.net Ford switched ends in Turn 3 and hit with the driver’s side. Rounding out the group was Dale Earnhardt, Jr., who broke the radiator of his #88 Axalta Chevrolet in a Lap 419 pileup. 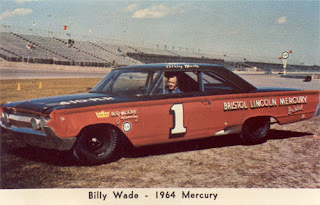 *This marked the first last-place finish for the #1 in a Cup race at Martinsville since April 26, 1964, when Billy Wade did not start his Bud Moore-prepared Mercury during the Virginia 500. Wade, the 1963 Rookie of the Year, scored all four of his Cup victories during the summer of 1964. 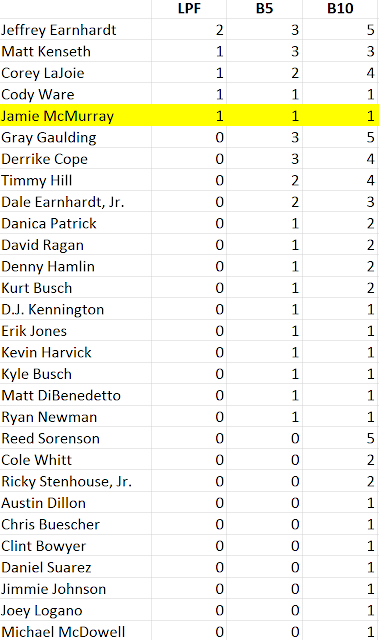 What’s more, the wins were in consecutive races, marking the first time a Cup driver had a four-race winning streak. His final win on July 19, 1964 was the last race run at Watkins Glen before it rejoined the schedule in 1986. Tragically, Wade lost his life at Daytona on January 5, 1965 in a crash during a Goodyear tire test. *This was McMurray’s first last-place finish in a Cup race at Martinsville. Do you know why Derrike Cope and the #55 team weren't at Martinsville? I recall hearing that Premium would field the 55 for Cope if sponsors could be found. That seems to be big hurdle still as Sorenson's 15 is also looking for sponsors.